Thousands of photos will form a giant mosaic of a suffragette to mark 100 years since British women won the vote. Here are just some of the stories behind the pictures about to go on show. 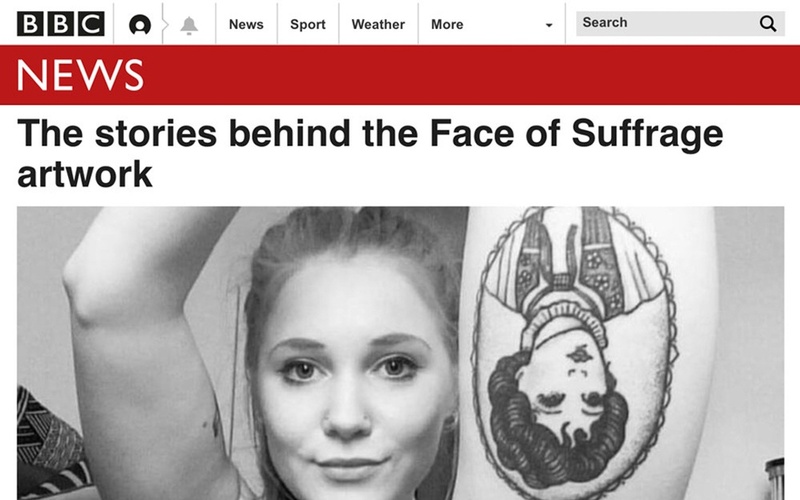 Illustrator Megan Price has such belief in the suffrage movement she has a tattoo of its most famous activist on her calf. “Emmeline Pankhurst is my absolute hero,” says the 28-year-old. “After seeing the film Suffragette I became so immersed in her story and her sacrifices. I’m a member of the Manchester Women’s Institute and we talk about her a lot. “I joined four years ago to get support from other independent women and I’ve made really great friends – so I’ve got more than I bargained for. “We’ve got about 160 members and are probably the most diverse in terms of age. We are really modern; we do make jam and that’s quite cute, but we do lots of different things. “I think in a lot of ways Emmeline would be really pleased with our progress – our right to vote and work and own property.